Also Recommended: Let's come back to this later. Notes: Based on the manga by Yuki Kaori. According to the cover this is supposed to be a story about an angel, Alexiel, that battles against God and loses, separating her body and spirit. Her spirit is then reborn on Earth in the body of Setsuna, a pretty boy with a very sticky problem. What the cover doesn't say is that Setsuna has a thing for his sister, and yes, it is one of those things. Much to my dismay, this is what the Angel Sanctuary anime is really about. 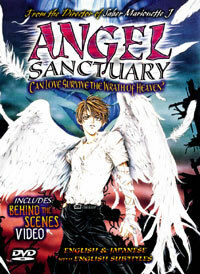 To explain how I even got conned into watching Angel Sanctuary, I must say that the artwork lured me in, and the supposed plot on the cover did not seem all that bad either. Unfortunately, in the end, there are not even words to describe what I think of this series. Heavens, I do not think there should be words to describe it. My best advice would be to stay away. The first and most obvious reason would be the weird relations between the characters. Because all three episodes focus on the brother-in-love-with-sister dilemma, there is almost no room for any other type of character development, and there isn't just one sibling set that has this problem. Rosiel, the brother of Alexiel, who is also an "inorganic angel", is another odd character that is in love with his sister. Not something I really want to go into, but suffice it to say that at least in this case Alexiel has not been interested in him. The only character actually worthy of mention in this series is Kira. He surprised me by not only having an almost cool personality, but by also having a semi-interesting past, while the others only masquerade as being interesting. The plot is very tangled, so I'll take great care not to get caught while trying to explain it. The real plot is supposedly about how after Alexiel's spirit was reborn in the body of Setsuna, her brother Rosiel was released as well, allowing him to set out on a quest to reawaken his sister's spirit. Two cross-dressing demons are also trying to wake the dormant Alexiel for some reason or another. (Luckily, not for the same reasons as Rosiel who is sure he can win his sister's love this time ... *gag*.) Anyway, during all this Setsuna is blissfully unaware of the trouble brewing around him since he is focusing all his attention on seducing his sister ... way more than enough said. Kira, Setsuna's acting guardian, is only involved in the respectable portions of the plot, for which I am very grateful, and that is what the title should have been about. Don't mistake, me all of this is actually in the episodes somewhere, but good luck trying to find it because this part of the plot is heavily bogged down by the "real" plot. The "real" plot centers entirely around Setsuna and his romantic interest in his sister, Sara. Alexiel's rebirth / reawakening is used only as a cover to give this title a semblance of respectability. A cover that, either fortunately or unfortunately, fails miserably. What is really horrifying is that that Setsuna and Sara are not the only two embroiled in a terrifying relationship. I cannot possibly overlook the fact that Rosiel has vowed to win Alexiel's heart in one way or another when she wakes. So even the respectable portion points back to the "real" plot. As I said there are no words appropriate for describing what I really think of this series so this is as far as I can take the plot. My advice would be to treat this series like the Black Plague. Avoid it, and burn any items that could possibly have been contaminated. On that note, let me say something nice about the title. The reason I actually bought it, the artwork, is amazing. I mean beautiful. Perhaps just a little too beautiful as I mistook Rosiel for a girl, but considering his name it really isn't my fault. At any rate, it is pretty, and the music is all right, I guess. Not really anything special. To tell the truth my mind was so shocked by the theme of the title that I didn't notice the music all that much, and I absolutely refuse to watch it again to find out if it was any good or not. What I do remember was that the English ib was absolutely horrid. The Japanese voice cast is rather generic, but much better than the English. Finally, I come to the end of my rant. I just have a few things left to say. First, that this title, for the health, safety ,and sanity of all anime-watchers ought to be reported to the Centers for Disease Control and quarantined immediately. It is tragic that Setsuna's situation is even mentioned in this title. It was completely unnecessary, and it totally ruined what could otherwise have been a solid and, I dare say, good story. Therefore, despite the fact that I absolutely despise Angel Sanctuary I will, reluctantly, give it two stars: one for the artwork, and another for Kira's character. Oops, seems I've misplaced one of the stars in the biohazard-waste bin. Oh well. Recommended Audience: Gruesome violence, adult situations, and risk of insanity and insomnia. I would recommend at least 16+. Watch at your own peril.